I like store-bought juice, but I like homemade juice 9,999,999 times better. I'd love to be able to serve the kiddos fresh juice with their breakfast, and I know with this in the kitchen, they'd have fun helping me whip it up too. As for the sorbet, well I haven't had sorbet since I was a child (my grandfather used to buy it). I'm well overdue to have some on my plate...or in a bowl, as the case may be. ;) One lucky winner is going to get the chance to make both, whenever and however they want to make it. Oranges are awesome so I would make a lot of juice! That is a great giveaway! I have wanted one of these for a while. Looks like a great giveaway! Have a terrific day. Sorbet? Bliss. I want some now. I would LOVE to make my own sorbet! What a great giveaway! Mango is my fav fruit. A friend told me that you could do the healthy veggies with the mango and it would still be tasty. Would love to try a juice fast - and the kids are all about the sorbet. I love oranges! The best way to eat them is fresh off the tree! Its great being a floridian! I've never seen a juicer and a sorbet maker in one! WOW! this sounds like an great product. I want so I'm entering. That does look like an amazing machine. My juicer stopped working. I told my husband to toss it. He thought I didn't want it if he got it working again. It worked, and he started running paper mache though it. I'm like, "WHAT!?!" Definitely a nice giveaway. There is nothing quite like freshly made juice. Sorbet--wow-it has been a while since I have had any of that. This is a very good giveaway. My favorite fruit are pineapples! I love them. We love making our own juices. This would be great for us especially during the summer. My son loves sorbet. It would be fun to make up a batch in this. I agree, you can't do better than your own fresh squeezed juice! Juicers are awesome. We just found one a few weeks ago. I need to experiment with it a bit more. I love juicing! Having added vitamins is always great, right? You do have the greatest giveaway contests. This juicer/sorbet-maker sounds amazing. My favorite fruit is apples and I just love the taste of them,I tend to like crunchy fruit the most My favorite veggies are crunchy veggies too with cauliflower being my favorite. I love just about any kind of fruit and vegetable but I particularly love apples. I like cutting them in slices and dipping them in peanut butter. My favorite is strawberries, because they are super good and they are AMAZING for you (especially your heart). I love them in peanut butter for a treat, but I love to have them plain for breakfast or in yogurt. i love berries but raspberries are my favorite. they're good with everything! I seriously LOVE Kiwis!! The taste, the texture, the color.. i love everything about them. I love slicing them and then cutting them 4 ways and adding them to the top of fruit salads, or just eating them alone!! I love healthy veggie + fruit juices. I usually add spinach, kale, half beet, orange, grapes, celery and carrot. That is my morning breakfast too. Love to win this juicer and enjoy my juices even better. I love a lot of fruits and vegetables. I like to eat apples cold, I like pears and oranges and I love using raspberries to infuse my water. My son and I both love fresh squeezed orange juice, but I have a old fashioned squeezer! I love steamed broccoli and cauliflower, but I also like them both raw in a salad of spinach leaves. Bananas are one of my favorite fruits. They are easy to eat on the run, go great in smoothies, and you can make a ton of desserts with them. I like baking banana bread. My fave is berries! I like most fruits and veggies! My favourite is apple, beet & pear. 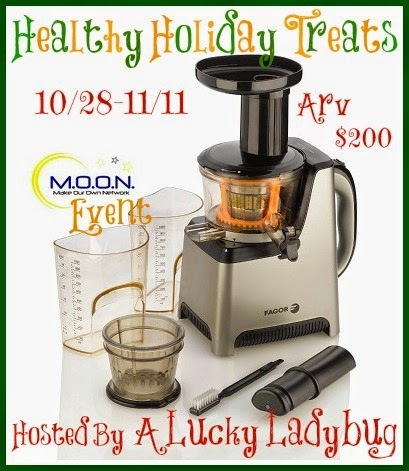 Who everyone won this juicer lucked out!